TECHNOgates is one of Melbourne’s leading commercial gate fabricators and installers. We provide economical, safe and dependable gates to protect against unauthorized entry, allowing for visibility whilst maintaining maximum security for your business. If you own a commercial property in Melbourne suburb , make a statement of class and style by allowing us to install superior quality commercial gates at the entrances and exists. Since commercial gates have so many roles to play, we recommend that you get a trained and experienced gate manufacturer such as TECHNOgates to design, manufacture and install one for your set-up. We execute our gating solutions with great responsibility and use the best quality hardware and materials to provide our customers with commercial gates that are solid, sturdy and durable. Apart from ensuring functional capability, we provide unique and highly appealing gate designs that allow you gates to stand beautifully in your property and make the whole set-up look even more grand and professional. Whatever kind of gate you require, we have a ready-made design for it. We can also create custom designed commercial gates that match your requirements. Whether you require them for your own commercial set-up or for the next commercial project you are constructing in Geelong, Bendigo or any other Melbourne suburb, get in touch with us at TECHNOgates, we guarantee delivery of the best quality commercial gates at the most affordable prices! For more information on any of our industrial gate solutions please contact us today. 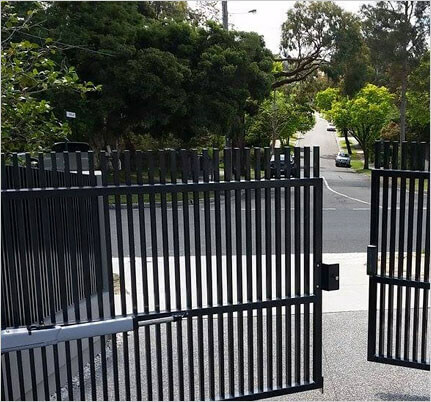 TECHNOgates is the first choice for companies looking for commercial gates in Bayside, Bayswater, Braeside, Clayton and Dandenong. Our reliable and durable gates are built to last and keep your property safe, so you can rest easy whenever you’re not there. You can trust that commercial gates in Mulgrave and Tullamarine are built with the full expertise and experience of our team who have worked and trained at locations around the world to come together and deliver the best sliding gates that fulfil your needs. It’s not about one size fits all but finding the right solution for your situation and we’ll work with you to make sure we get there. We also supply industrial gates in Dandenong, Moorabbin and Springvale for companies that need large, more secure and safer gates. This is as much for safety as it is security and a sliding gate will offer easy access for those who are meant to have it while restricting those who don’t. For more information on our commercial gates in Clayton and other areas across Melbourne, contact our team today or speak to us now on 1300 923 224.